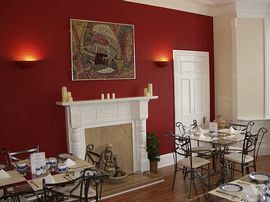 Shona and David Paterson look forward to extending a warm welcome to you at the Beechwood, a beautiful refurbished Victorian house within walking distance of Ayr's award winning town and shopping centre. The Beechwood consists of two adjoined houses, one in which your hosts live and the other for the use of guests. This unique set-up allows you the independence of a hotel but at sensible guest house prices. Our spacious rooms are all en-suite and for your additional comfort and enjoyment have a hairdryer, television, tea and coffee facility, full-length mirror, luggage rack, central heating and easy chairs and table. We have worked hard designing the rooms and you should find them to be decorated to the highest standard and in excellent taste. You may also enjoy one of our sea view rooms looking straight across to the beautiful Isle of Arran. We also have alarm clocks in all our rooms, so don't worry you won't miss your flight! 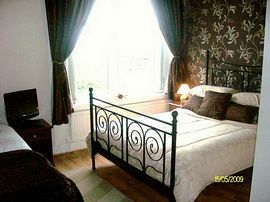 Close to Prestwick Airport, Affordable quality rooms. 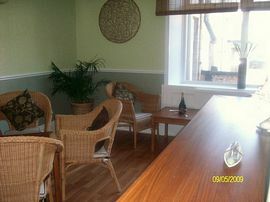 Hotel set up at Guest House Prices with delicious breakfast. Pet Facilities: Pets are allowed. £5.00 charge for small dogs per stay to allow for deep clean. £7.50 charge for larger dogs. Dogs must be kept in the room or go outside. No access in public areas unless the dog is a blind dog or hearing dog. Special Diets Provision: Special diets are catered for. vegetarian, vegan, wheat free, dairy free. Just let us know your requirements. We are happy to help. Trains from the airport to the Newton-on-Ayr Station (just around the corner from the Beechwood) run every 15 minutes past the hour, the last train being at 11.15 pm. The service takes only a couple of minutes, Newton-on-Ayr being the second stop. From Newton-on-Ayr to the Airport they are also around 15 minutes past each hour. The first train is at 5.45 am in the morning. To get to us from Newton-on-Ayr Station come out of the station, walk up to the main road ahead, turn left, and we are a 1 minute walk on the left hand side. A taxi will cost you about £5.00 to £6.00 depending on the time of day you are travelling. Fares are slightly more expensive before 6.00am or after 12.00am. 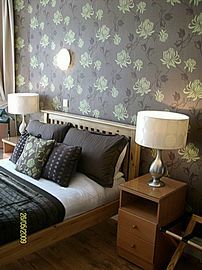 Single Occupancy: Low from £25.00 Mid from £30.00 High from £35.00. Double/Twin: Low from £42.00 Mid from £45.00 High from £50.00. Family Room: Low from £47.00 Mid from £50.00 High from £55.00. 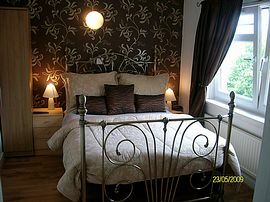 Family Suite: Low from £70.00 Mid from £75.00 High from £80.00. You can check in to The Beechwood anytime between 4.00pm and 9.30pm. We can arrange earlier check in times or later check in times if a specific time is given. We are also able to offer a pin code to allow you the freedom to check in at anytime using our self-check in procedure. Just let us know your requirements and we will accommodate. Check out by 10.45am unless special arrangements are made.